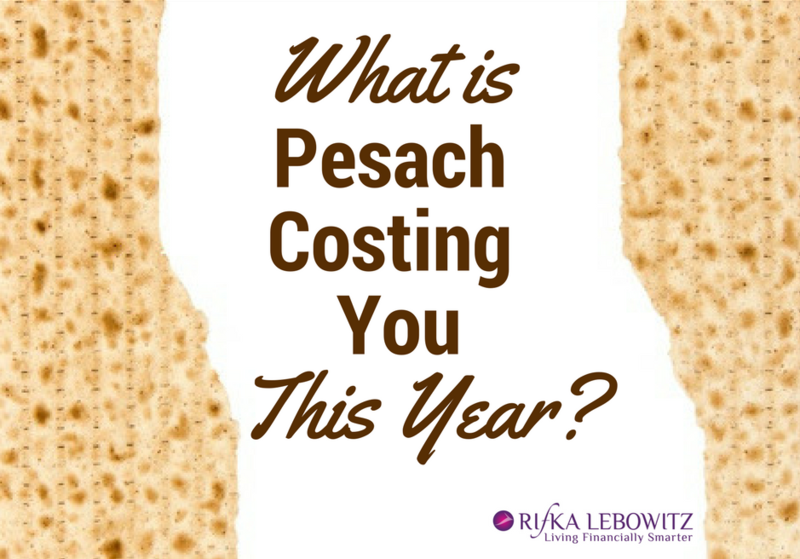 What is Pesach Costing You This Year? When you live in Israel you feel each holiday in the air, regardless of your personal observance. Work and school days are scheduled around them, grocery stores follow the needs and themes of each holiday and even the buses include a happy holiday message in their digital display. Of course, Pesach is no exception. From the day purim ends, the grocery stores start cleaning their shelves and displaying kosher for pesach items while eliminating the chametz items. School ends the week before pesach begins and camps are offered to solve the childcare issues many parents face. And while this holiday is meant to be a festival of freedom the extra expenses that come along with it can feel quite burdensome. For many it’s the most expensive two weeks of the year! As a financial consultant with a passion for helping Olim make financially smarter choices, I asked my Facebook group how much extra Pesach cost them above their usual monthly expenses. I asked them to take into account the extras for the week before including child care, food, outings, and lost income. The average response was 3,000NIS and for some the costs easily went up to 15,000NIS, which is a big chunk of a normal monthly income for many when their expenses included sending multiple children or grandchildren to camp or on youth trips, hiring extra cleaning help, holiday outings, food and more. So how can we manage to get back to the root of what this holiday is meant to be about instead of drowning in a sea of debt? As in most things of life, the first step to solving a problem is to figure out what the issue is and make a plan to manage it. If you don’t yet have a pesach plan drawn up start now. Include EVERYTHING extra: childcare, babysitters, cleaning help, transportation, menus, grocery shopping, trips… anything you need done along with its cost over the next two weeks should be noted. Once you have all this listed go over the list and see if there is anywhere you want to cut back. Then transfer the info over to a budgeting program or an organized spreadsheet (there are many downloadable templates available which you can adjust to fit your needs). Make a column with expected cost and one to note the actual amount so that you can prepare for next year as well. While it may be tempting to split payments over the course of a few months, DON’T! This is not a financially sound plan. Two if you need, but not six!!! If you take 6 payments you will still be paying for Pesach when it comes to Rosh hashana and then succot! This is where many fall into the deep end and start to drown in debt. Better to stick to a smaller budget and start planning for next year instead. Add what you spend on pesach into your annual budget. Try to set aside as much as you need each month so that when you get to Pesach next year you’ll have the resources to cope. Yes, you have a plan and if you stick to it you’ll be fine. But as in all things in life, plans can change and surprise expenses can come up. If that does happen, don’t stress over it. You may have to budget more carefully for the following months to make sure you get out back on track soon. Can you share with others? Make giving part of your budget by giving those less fortunate the ability to celebrate the Chag, while you can enjoy the freedom and value found in giving.